Cover bulgur with boiling water and let stand until soft, about 30 minutes. Pour off any excess water. Rinse and trim Brussels sprouts. Cut in half lengthwise then slice crosswise into thin strips. 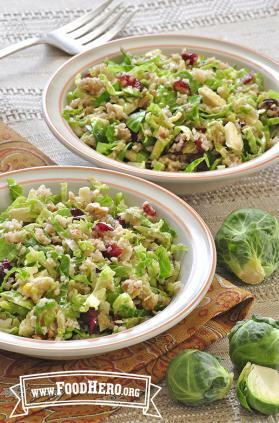 In a large bowl combine bulgur, Brussels sprout strips, cranberries and nuts. In a small bowl or jar with a lid, combine orange juice, oil, vinegar, salt and pepper. Mix or shake well. Pour dressing over salad and serve.